MAV’s are defined by the Defense Advanced Research Projects Association (DARPA) as aircraft that are smaller than a 6” cube, severely limiting the size and design of the overall plan form shape of the MAV body. With the limit on the chord and span being 6”, wings that fit into this design space are referred to as low aspect ratio or LAR wings. LAR wings are defined as wings that have an aspect ratio around 1. LAR wings typically have no taper due to the loss in overall surface area. Until recently LAR wings at low Reynolds numbers had not essentially been studied. LAR wings are extremely susceptible to the effects of wingtip vortices. In these wings, tip vortices may be present over the majority of the wing area and therefore influence overall aerodynamic characteristics greatly. Wings with an aspect ratio less than one can be considered to have two sources of lift, linear and nonlinear. Linear lift is generated by circulation around the airfoil as found in higher aspect ratio wings. Nonlinear lift occurs due to low-pressure regions on the upper wing surface generated by tip vortices. This nonlinear lift effect increases the lift-curve slope as the angle of attack increases and results in a higher stall angle. A number of LAR wing plan form shapes are available for consideration. 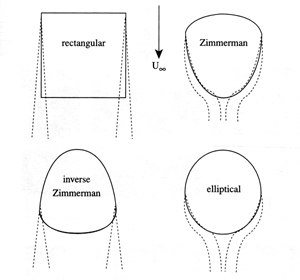 The most relevant plan form shapes for MAV applications include, rectangular, Zimmerman, inverse Zimmerman, and elliptical. In order to form the Zimmerman and inverse Zimmerman shapes; two half-ellipses are joined at either the quarter chord or three-quarter chord point respectively. After reviewing previous studies done on LAR wings and successful MAV’s, we concluded that the inverse Zimmerman was the best choice for plan form shape. While other shapes, such as the rectangular plan form used on the Black Widow MAV, have more area to generate lift, it is apparent that they will have poor control surface effectiveness due to the strong vortices generated by the wingtips. This is also a problem for the elliptical and the Zimmerman plan form shapes. The inverse Zimmerman, however, is not as effected by wingtip vortices due to location of the maximum span at the tail. The inverse Zimmerman shape is also highly desirable due to similarity of its aerodynamic characteristics with those of a delta wing. 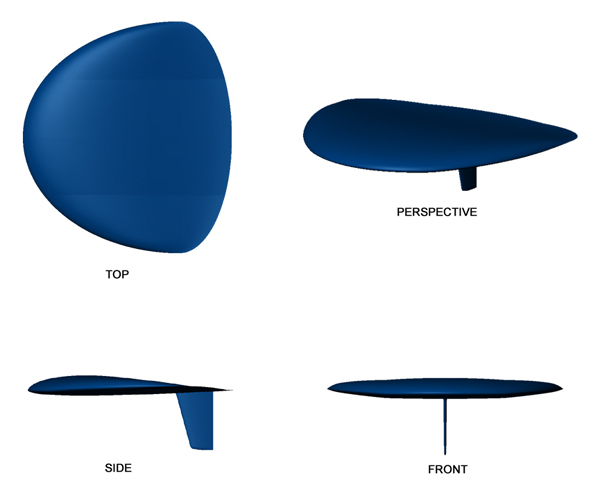 With a delta wing, the wing size normal to the flow increases along the centerline. This allows the control surfaces to be highly effective, even in the presence of strong vortices. Therefore, in summary, the MAV body will have an inverse Zimmerman plan form shape and a span of 6 inches and a chord length of 5.4 inches.